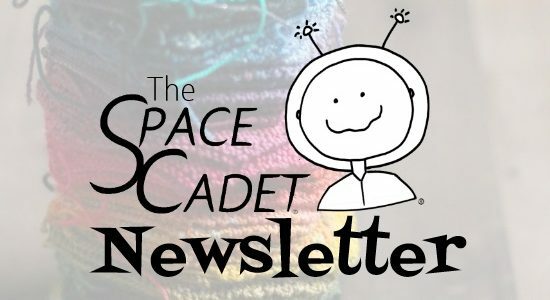 SpaceCadet Newsletter: a Yarn & Pattern Giveaway! It’s deepest February and all I want to do is curl up on the sofa and knit. Yesterday, we woke up to a winter wonderland — and some seriously treacherous roads. The schools around here were closed and, even though the SpaceCadet crew were trying to organise how they’d get to work, I told them to stay home (“Don’t do anything dangerous for yarn… It’s just yarn!“). Everything could wait until tomorrow. And so I got my wish: an hour or two of quiet time, curled up with my tea and knitting, and watching the snow. Today I’ve woken up to cold, grey rain. The beautiful snow is fading away quickly and the roads (thank goodness) are pretty clear… and the work we didn’t get done yesterday now needs to be done today and in double-time. So instead of starting my day slowly the way I’d like, I’ve poured myself some strong coffee to get things moving. But first… well, first I do have some fun stuff to share with you. So let’s just take five, shall we? I’ve got time for that if you do! First, a giveaway! When I reached out to Marceline Smith this week, she kindly offered two copies of her Pebbles & Pathways socks pattern for a giveaway, and I’m throwing in a skein of SpaceCadet Oriana to go with each of them. Scroll down to see the pattern and get all the details! Once Spring arrives, the gnomes will get busy in your garden (it’s absolutely true). What better way to welcome them than with Sarah Schira’s Gnome de Plume MKAL? The first clue goes out on March 11 (when it will surely start to feel like Spring, yes?) and, until then, all her gnome patterns are 25% off with the code “GnomeDePlume”. Click here for all the MKAL details. I am so so sorry to do this to you, but when I heard that researchers used the evolution of body lice to determine the point in history where humans began wearing clothes, I really did find it too interesting not to share. Pick your tolerance level: this article gives a summary but does include images of lice and this article is longer but without any itch-inducing pictures. I’m scratching like crazy either way. Blech!!! Did you see this cool video using a ball of yarn to illustrate issues around sexism and bro-culture in the office? After years of working in an industry that was seriously male-dominated, it rings so true for me (despite the rather sugary-sweet conclusion). And though it’s clearly about gender-based issues, if the recent discussions on Instagram around racial representation and inclusion feel at all unrelatable, I think viewing this same video through a race-based lens may help make the importance of those issues a little clearer. 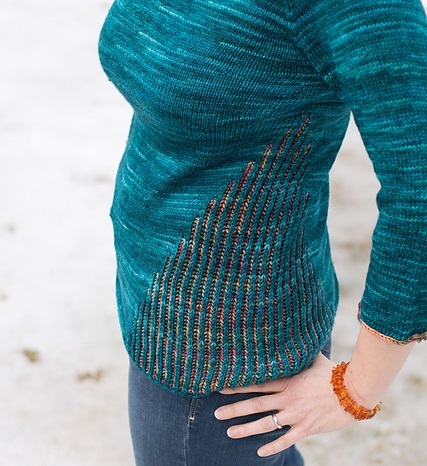 Exciting news for lovers of double knitting! The designer behind BuildingBlox and (undisputed Heavyweight Double-Knitting Champion of the World*), Alasdair Post-Quinn, is hosting a fabulous Week of Double Knitting Workshops from April 27 – May 5 in Cambridge MA. Whether you’re brand new to this technique or want to take your skills to an advanced level, it’s an amazing opportunity to get away from everything and dive deep into this intriguing style of knitting with one of the world’s leading experts. Click here for all the details. *I totally made that title up. Mini-Skeins on Their Way Soon! Just a quick heads up to the members of the Mini-Skein Club that we are sending out February’s parcels this week, so keep your eyes on your mailboxes! In the meantime, I’m trying to figure out how best to photograph this wonderful collection of hexagons that my assistant has knitted out of an (almost) entire year of our Ombre&Gradient Mini-Skeins (it starts with January 2018 at the bottom and goes up to November at the top). They’re destined to become an epic garment when they’re sewn together but I want to create some sort of flat-lay image (or maybe a stop-motion video) that shows them in chronological order. Any suggestions how best to lay them out? • and third, this year they’re doing a Happy Hour from 3-5pm (with a cash bar… woot!) and special goodies from the vendors. 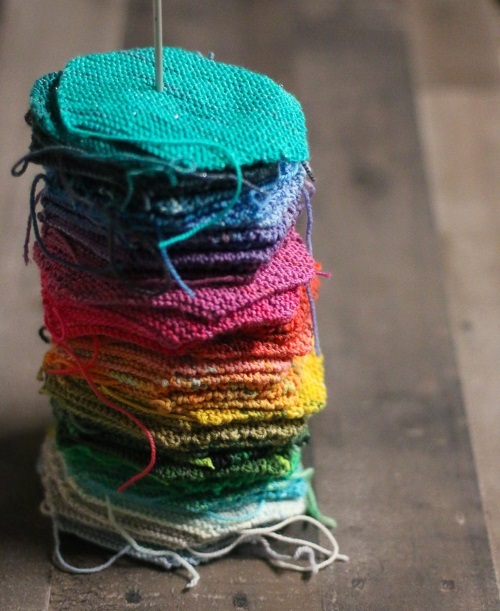 Marceline says, “I love the small canvas and the endless possibilities of a knitted sock. Just enough stitches to draw you in, and small enough to take with you everywhere.” And I couldn’t agree more! 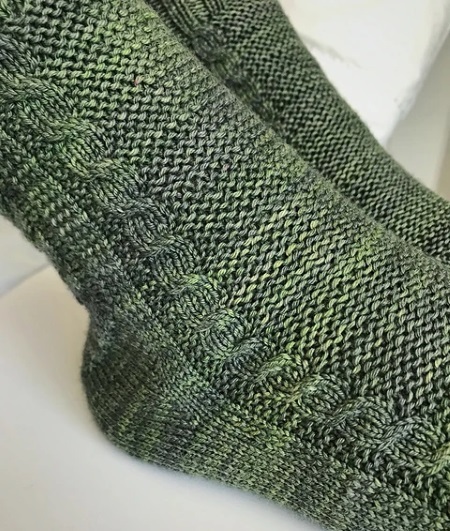 When I reached out to her this week, she kindly offered two copies of her beautiful Pebbles & Pathways Socks pattern for a giveaway, and I decided to throw in a skein of SpaceCadet Oriana to go with each one! To enter, all you have to do is make sure you are following both Marceline and me on Instagram (she’s HeyBrownBerry and I’m SpaceCadetYarn) and then leave a comment on this Instagram post telling me what YOU love about knitting socks (or what you hate — I’m ok with that too!). And if you’d like an extra chance to win, tag a friend in an additional comment (tag as many friends as you like, but each tag must be in its own comment please). For full sweepstakes details and an alternative method of entry, click here. 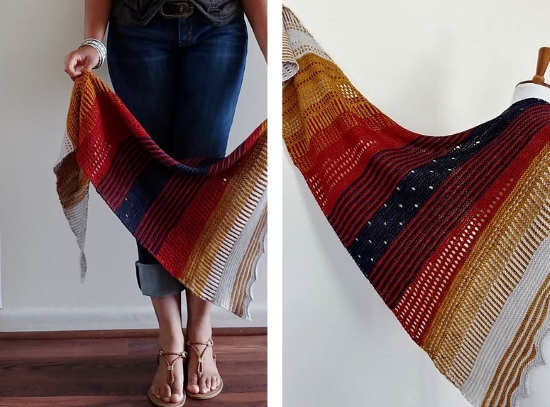 When I spotted this gorgeous shawl on Ravelry, it nearly leapt off the page at me. I love the use of strong colour, the slipped stitches and brioche to blend colour, and the short rows to create the shape. This is a great design to go bold with! I’d cast it on in Astrid in Sliver, Honey, Mars, and Dark Skies. 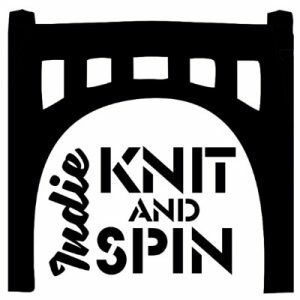 Ok, it’s time I get this show on the road… We’re packing yarn for Indie Knit and Spin this weekend, packing club parcels, and dyeing some fun club colourways. It’s going to be a busy day! I hope your day is just as full of (fun) stuff and, until next time, all my best! SpaceCadet Newsletter: an Unforgettable Day…?